It's impossible not to love the concept of doubleTwist, the all-devices-welcome quasi-iTunes music manager, but up to this point the software has been pretty barebones. Now, things are gettin' ser-i-ous: doubleTwist has a built-in music store, courtesy of Amazon. 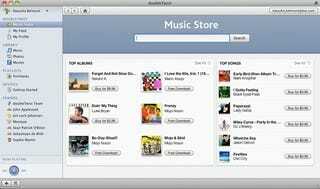 As has been the case with every other aspect of doubleTwist, the music storefront looks like a simpler version of the one in iTunes. Navigation and searching are about as simple as they could be, as are downloads, which only take a few clicks. The whole experience will be familiar to anyone weened on Apple's bloated beast, apart from a few things: Amazon's album prices are often lower than iTunes', and of course, you can immediately sync any music you download—there's only music, by the way—to practically any device you own, be it a Pre, a BlackBerry, a Sandisk, an iPod, or whatever.